Community Outreach - Eden I&R, Inc.
Eden I&R’s (EIR) mission is to link people and resources. EIR’s 2-1-1 Alameda County Communication System is a free, 24/7 multilingual phone service through which live Resource Specialists provide critical health, housing, and human service information. EIR strives to ensure that all Alameda County residents and employees, particularly the most vulnerable in the community, have easy access to information about appropriate and useful services and housing. Additionally, 2-1-1 becomes THE public communication vehicle in the event of a local, regional, or countywide disaster. 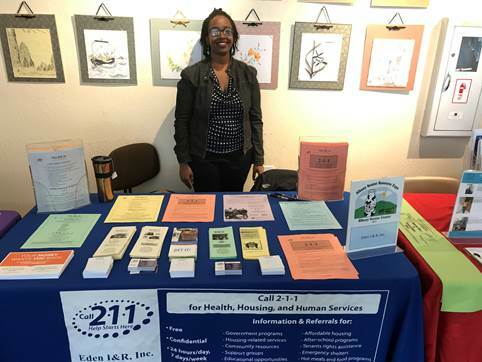 Every year EIR staff and volunteers attend hundreds of community events, trainings, and fairs throughout the county to make people aware of 2-1-1 Alameda County as well as some of the valuable programs contained in the Services Database such as CalFresh and Medi-Cal. EIR staff also provides a variety of disaster preparedness trainings and distributes disaster-related information to the public. For more information about disaster preparedness trainings and workshops or for presentations on 2-1-1 Alameda County and Eden I&R’s other programs, contact our Development Manager, Catherine Stahl at cstahl@edenir.org. If you’d like to be an Eden I&R Volunteer Ambassador, representing the agency by tabling at events and local fairs, contact Jeanette Mills at jmills@edenir.org to set up an Ambassador orientation.